Vitamin B-12 is just one of the many vitamins your body needs to stay healthy and function properly, and it plays an essential role in nerve and neurological function. If you're not getting enough of this important vitamin, your body will let you know, often through pain in the legs or other extremities. While pain related to a vitamin B-12 deficiency can negatively impact your life, prompt treatment can reverse the damage and relieve the pain. A vitamin B-12 deficiency causes a wide range of symptoms, such as gastrointestinal discomfort, general weakness and disorientation. Symptoms often develop gradually over time, and may increase in severity as the deficiency progresses. Those with a deficiency may also experience nerve pain, commonly in the legs, though other areas such as the arms or hands may also be affected. In addition to pain, a B-12 deficiency may also cause sensations of tingling or numbness in the legs or other parts of the body. 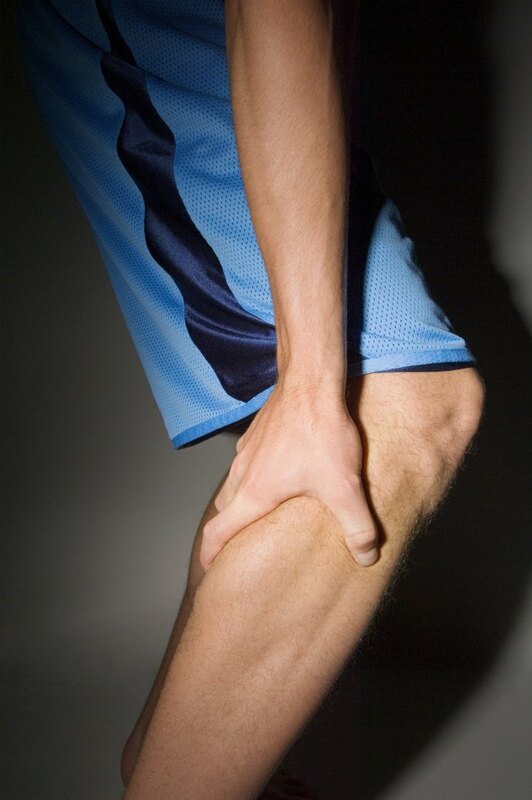 Leg pain and numbness associated with a B-12 deficiency are caused by peripheral neuropathy, which develops due to damage to the myelin sheath surrounding your nerves. This sheath protects your nerves and allows them to function properly, and once damaged due to a lack of B-12 in the body, your nerve function becomes affected, causing nerve pain and other uncomfortable sensations. If left untreated, peripheral neuropathy due to a B-12 deficiency can have serious consequences and may cause a permanent disability. Nerve damage caused by an underlying B-12 deficiency can be treated by restoring adequate B-12 levels through either oral supplementation or B-12 injections, though some of the damage may unfortunately be irreversible. Consequently, prompt diagnosis and treatment is essential in order to reverse as much damage as possible. The longer neuropathy pain is present, the greater your chance of sustaining some degree of permanent damage. If you've been diagnosed with a vitamin B-12 deficiency, treating the symptoms and reversing any potential damage is just the first step. You also must work with your doctor to determine the cause of your deficiency. Often, an autoimmune disorder called pernicious anemia leads to a B-12 deficiency, and a blood test can determine if you have this disease. Other causes include an inadequate diet, atrophic gastritis, infestation with intestinal parasites and certain bacterial infections.